Parallels between actual towns and the Heavenly Jerusalem were frequent during this time period. 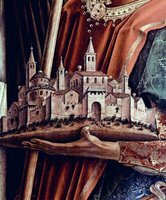 Crivelli, Carlo, 15th cent.. Model of a city, detail from church altarpiece, from Art in the Christian Tradition, a project of the Vanderbilt Divinity Library, Nashville, TN. http://diglib.library.vanderbilt.edu/act-imagelink.pl?RC=46728 [retrieved April 23, 2019]. Original source: http://www.yorckproject.de.